PT. 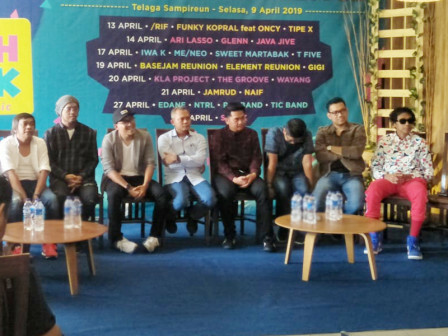 Taman Impian Jaya Ancol is about to hold Ketje Flashback 90's music concert at Lagoon Beach, Ancol, North Jakarta, this weekend on Saturday (4/13).
" Anyone who buys Ancol entrance ticket can enjoy this concert for free"
This event will be enlivened with popular bands and singers in 90's era such as /rif, Funky Kopral, Base Jam, Iwa K, GIGI, T-Five, Wayang, Element, ME, Glenn Fredly, and Slank. PT. Taman Impian Jaya Ancol Division Head, Budi Aryanto explained, 90's music theme is chosen because nowadays this music trend is rising again. "We want to entertain the 90s era music fans by bringing back their favorites 90's singers and bands in this concert," he conveyed, Tuesday (4/9). More importantly, Ancol visitors can enjoy this concert for free. "Anyone who buys Ancol entrance ticket can enjoy this concert for free," he said.